Paris, November 24th 2017 – Motion Equity Partners (« Motion »), an independent mid-market European private equity firm announced today that they had signed an agreement with LFPI Gestion (« LFPI ») and co-investors (Naxicap Partners and Omnes Capital) to acquire Laboratoire Equilibre Attitude (the « Group »). LFPI will also re-invest as minority shareholder to be part of the Group’s next development phase. Headquartered in Vallauris (France), Equilibre Attitude is a French pharmaceutical laboratory specialised in food supplements distributed through pharmacies and para pharmacies. The Group was established by LFPI through the merger of Laboratoire des Granions (founded in 1948), Laboratoire Equilibre Attitude and Laboratoire Merle. As a result, the Group has a diversified portfolio of health supplements, drugs and sports nutrition products, with some key brands including “Granions” (oligotherapy, mono ingredient and health oriented nutritional supplements), “Chondrostéo” (the market leader in Joint Care food supplements) “Conceptio” (fertility and pregnancy related food supplements, with a pioneer position in men fertility), “EAFit” (the French market leader in Sports Nutrition and Active Slimming products) and “Foucaud” (body care products with essential oils). 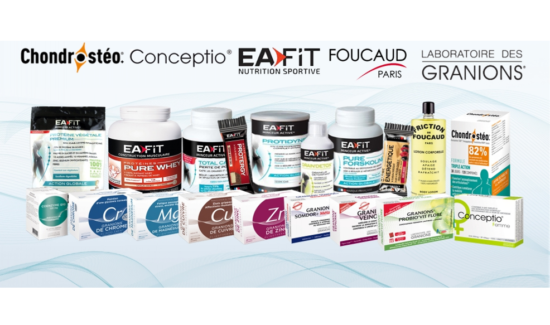 Laboratoire Equilibre Attitude distinguishes itself with a medical approach to food supplements, offering formulations supported by scientific evidence of effectiveness (AMM, clinical studies, patented ingredients, etc.). Laboratoire Equilibre Attitude’s R&D capacities and its “Pharma Grade” DNA allow to meet all of its customer needs. Products are either sold on prescription or OTC and are mainly distributed through pharmacies and para-pharmacies. The Group operates with 3 production and logistic sites: Vallauris (head office & logistic platform), Monaco (Laboratoires Granions) and Selles Saint-Denis in Sologne (Laboratoires Merle). The Group counts c.140 employees. The development strategy carried out by LFPI and its co-investors over the past years has allowed Laboratoire Equilibre Attitude to position itself successfully as one of the key brands for the pharmacist but most importantly also for the consumer. Under LFPI’s ownership, Group has strengthened its in-house salesforce, developed organically a strong expertise in some segments, and accelerated its innovation process to seize emerging trends in its markets. Laboratoire Equilibre Attitude‘s next development phase will involve strengthening its position in selective distribution and accelerating its digital strategy, taking advantage of its “Pharma Grade” DNA, its strong brands and the growth initiatives set up by LFPI over the past few years. Laboratoire Equilibre Attitude will further expand its product offering, both organically and via acquisition. Motion Equity Partners has analysed this investment opportunity alongside Caelestys, company founded by Olivier Caix (former CEO of Diana Group under Motion Equity Partners’ ownership). He will join Laboratoire Equilibre Attitude as Chairman. Olivier Caix, CEO and Founder of Caelestys “Laboratoire Equilibre Attitude relies on strong positions in dynamic segments, especially in Sports nutrition, and benefits from its scientific and pharmaceutical know-how. Together with Motion Equity Partners and the Management team, we are convinced of having the unique opportunity to build a major group in the field of dietary supplements, developing a pharmaceutical laboratory at the service of active nutrition. Our strategy will be to reinforce leadership positions on targeted segments, through organic growth and acquisitions, as well as accelerating international development thanks to these strengthened positions”.